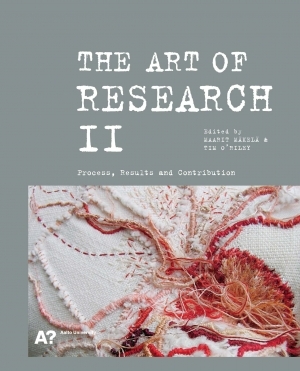 The Art of Research II is an anthology of artistic research concerned with process, results and contribution. This anthology draws together material from ’The Art of Research’ conference held at the University of Art and Design Helsinki in 2009. O’Riley edited chapters with Maarit Mäkelä, and contributed an extended introduction to the anthology, in which he considers the entanglement of reflecting, writing, making and the role of serendipity in the context of practice-led research. By presenting examples of case studies and practical and theoretical reflections, as well as laying out some of the relevant territory, the anthology provides a practical and philosophical contribution to the current debate surrounding practice-led artistic research. The book develops thinking explored in O’Riley’s paper, ‘A discrete continuity: On the relation between research and art practice’, for the peer-reviewed Journal of Research Practice (2011). This paper develops a conception of practice-led artistic research that acknowledges the multiple methods that inform creative practice while sympathetically reflecting the conditions and motivations that lead to it. O’Riley sees research as an operating structure for the process and production of art; he regards it as integral to the processes of creative enquiry and critical reflection. O’Riley asserts that these processes are not necessarily discipline-specific – although particular disciplines have specific procedures and goals – and it is argued that provisionality is central to what art can offer other disciplines: it can make a virtue of incompleteness. The research builds on O’Riley’s earlier anthology Reflections and Connections: On the Relationship Between Creative Production and Academic Research (2009), which explored concepts of practice-led research developed in papers given at the Art of Research conference at the University of Art and Design, Helsinki in 2007.